Thursday: Sports Day for all the freshmen and sophomore students. No classes today! We go out in the morning to watch all the events. (100, 200, 1500 meters, shot put, high jump, 31 leg race, basketball roll, etc.) 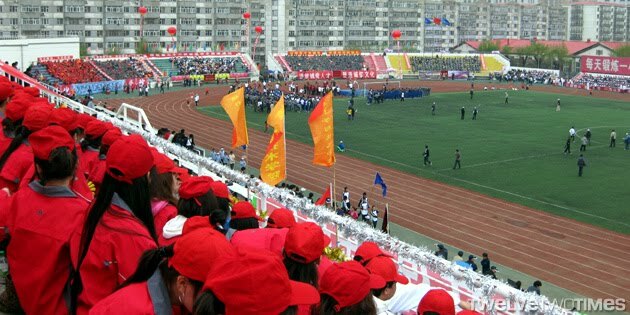 Most of the students signed up for events they have not practiced much before. It's awesome to cheer our students as they try their best at their chosen event. While we went to watch, I got convinced (more like forcibly recruited) to participate in the basketball roll. The event was simple enough. 12 people in a line roll a basketball between their legs, the last person catches the ball and goes to the front of the line to pass the ball through the legs again. One month remaining in the semester and we're just getting warmed up.